Sharon Bowen thought her late husband was a bit crazy for buying a scrapbook filled with black and white photos of Cleveland ballplayers from the early 1900s - but not anymore. It turns out that book held what may be the only autographed photo of Shoeless Joe Jackson, the Holy Grail of baseball signatures. How many Jackson signatures are in existence isn't clear, but most experts agree that it's probably fewer than 100. But this is the first signed photo authenticated by autograph experts, according to Heritage Auctions, which is handling the sale of the century-old photograph this month. "If I were a betting man, I'd say the chances of another one surfacing would be highly unlikely," said Joe Orlando, president of Professional Sports Authenticator, which validated the signature and photo. Bowen's husband, Bill, first saw the scrapbook about 10 years ago. "I told him 'absolutely not,'" Bowen said. "Luckily for me, I lost that argument." Her husband kept the book in a trunk, looking at it almost every day and showing it off to friends. A collector all his life, he appreciated its history and connection to his hometown. Not knowing the book's sky-high value, they never locked it up or worried about keeping it out of sight. "It wasn't an investment," she said. 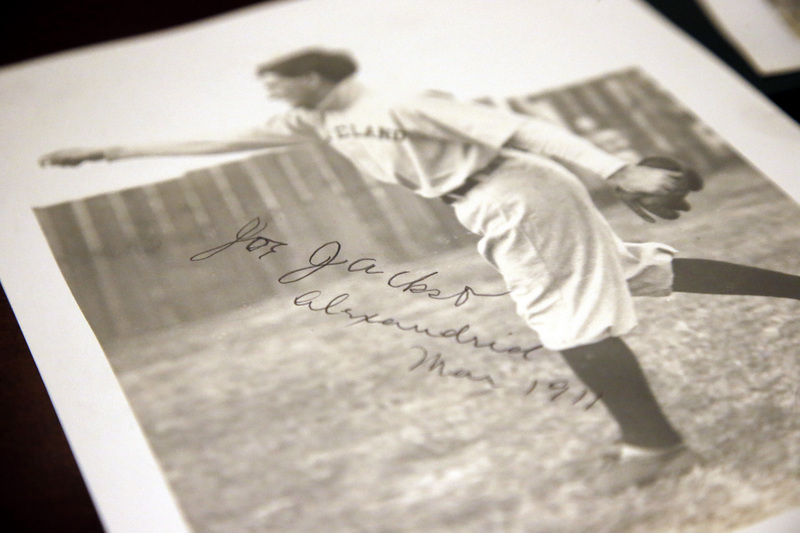 The signed photos of Jackson and other members of the Cleveland Naps, the team that later became the Indians, will be sold in New York City on Feb. 21. The photo of Jackson - taken the year he became the only rookie to hit over .400 - had an online bid of $42,000 as of last week. And they verified the autographs - not an easy task when it comes to Jackson's childlike signature. It's known that Jackson more or less signed his name by mimicking a pattern that his wife had made. She often signed his name, too. Mike Nola, official historian for the Shoeless Joe Jackson Society and a board member of the Shoeless Joe Jackson Museum in Greenville, South Carolina, said he can't remember seeing another signed photo of Jackson. There are well over four dozen legitimate Jackson signatures that he knows of, including several bats and at least a dozen baseballs, he said. "That's still pretty rare especially by today's standards when guys are signing everything," Nola said.